For us, one of the glorious parts of the Spring season are the Pontchatula Strawberries. They hit our market in the small neighborhood produce stands early April. We purchase a 1/2 flat every 5 or 6 days and enjoy with (with plenty of whipped cream) at breakfast, lunch and dinner almost every day. It is an important part of our Spring ritual. We typically go on vacation right after Jazz Fest and are no here to see the end of the season; it's just over when we return. I stopped for a half flat on Wednesday and the woman at the stand told me the season was almost over; she didn't expect them to run through the week; it's just getting to warm. So, I jumped into immediate action and instead of buying a half flat, purchased two flats. Brought them home, and Beau & I spent quality bonding time, elbow to elbow, at the kitchen sink cleaning and cutting these end of the season beauties. Then, out came the food dehydrator. We can load almost a 1/2 flat to the dehydrator (4 shelves) at a time and it takes somewhere around 15 hours to dehydrate them. 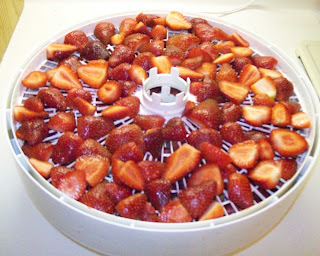 Amazingly enough, 1/2 flat of strawberries dehydrate down to about 4 cups. We'll be going by the produce stand again tomorrow and are hoping to get lucky one more time and come home with about 2 or 3 flats. These are amazing dehydrated. The flavor magnifies to a glorious explosion and I'm looking forward to have these beauties on my cereal all summer long. I bought strawberries recently, but only came home with the whipped cream after the bag boy left a bag out of our cart. That was VERY disappointing. I don't like strawberries becos the ones we get in the supermarkets are really sour. But strawberries are good to look at. 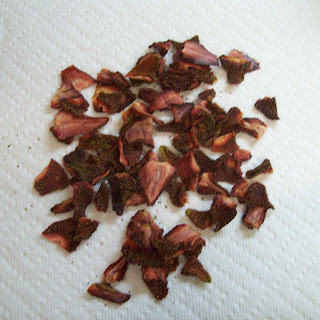 This dehydrator thing is very new to me. So this is how it's done! Lana, how upsetting! I didn't see any at the Grocery (Rouses) yesterday, but I think the produce stand on Hwy 22 still have them ... better rush; it would be a shame to go the whole season and not have some of our own !